Major League Baseball’s now-infamous “Turn Ahead the Clock” promotion in 1999 was largely conceived by Steve McKelvey, who was working for a sports marketing agency at the time. McKelvey, who now teaches at the University of Massachusetts, recently shared his recollections of the project with Uni Watch’s Paul Lukas. Uni Watch: What was your role in the Turn Ahead the Clock promotion? Steve McKelvey: I ran the sports marketing agency PSP Sports. We were the agency for Century 21. They had come to us and asked us to create a sports platform for them. UW: I thought PSP was a publications company. SM: Yes, but they had started a sports promotions operation, and I was brought in to run it. Century 21 was one of our clients. We identified baseball as the best platform for them, and we came up with the Century 21 Home Run Derby and also wanted to work with MLB to do something in conjunction with the individual teams. UW: And that was the Turn Ahead the Clock idea? UW: I think it was actually 14 games. SM: Yes, sorry, that’s right. And the participating teams had varying degrees of enthusiasm and involvement, I guess you could say. And I had worked for Major League Baseball for six years — I’d worked on old-timers’ games, turn back the clock games. So I pretty much knew the drill. So with the turn of the century coming, this seemed like a perfect idea for Century 21. UW: Was it a tough sell for the Century 21 people, or to the people at MLB? SM: Probably tougher for MLB. Century 21, they kind of bought into it, because it was right in there with what they wanted to do in terms of building brand awareness. Remember, their whole marketing campaign at that time was to make real estate fun. UW: And MLB was more resistant? SM: Their resistance was mostly in terms of the changing of the uniforms. Just the idea of designing futuristic uniforms — in the end they were pretty open to it. John Brody was the point person for MLB, and he’s a pretty progressive guy. But it was new, and it was a big challenge, and I think some of the teams had reservations. UW: Yeah, you mentioned that some teams were less enthusiastic than others. And of course certain teams opted not to participate altogether. Do you recall why? SM: Well, the Yankees, because of the pinstripes. UW: Right. And some of the other older, more traditional franchises opted out, like the Dodgers and the Cubs. But the Expos didn’t participate either, and they were obviously a newer team. SM: I’m not sure we even asked the Expos, because they were in Canada. UW: Oh — does Century 21 not operate in Canada? UW: Were there teams that agreed to do it but pretty much said, “Just give us the uniforms, we’ll wear them, but don’t expect us to put a lot into this program”? SM: Yup. But that was a minority of the teams. Most of the teams wanted to do as good a job with it as they could. And we gave them a manual of all the things to do, what to put on your scoreboard, how to change your P.A. system, all of that. Of course, the uniforms were the most important component. UW: Do you still have one of those manuals? SM: I don’t think so. UW: Too bad — wish I could’ve seen that. Who did the actual uniform design? UW: And what about the manufacturers — Majestic and Russell Athletic. Were there any problems in terms of working with them? SM: No. They were fine. The biggest challenge was that we got this deal done in January — actually, it might have been later than that — and Century 21 wanted all of the futuristic games to be played after the all-star break. SM: Because they wanted to use the home run derby as a platform to announce it. Anyway, we got this thing signed off on kind of late. And it got kind of panned in the local press in many markets, mostly for the uniforms. Now, the teams that did it right, they did draw additional attendance, and the fans loved it. But because we got such a late start, and because the whole thing was taking place in the second half of the season, it was a real challenge from an execution standpoint. SM: Right. I mean, we were signing off on some of these things probably in June! Russell was making the uniforms on almost a per-week basis at one point. “What game do we have this week? OK, we’ll make those uniforms. What’s next week?” Like that. It’s no way to run a ship, but it is what it is. And then we had the problem with the last game, because the Red Sox uniforms didn’t show up [because the shipping was delayed due to Hurricane Floyd]. By that point, everyone had seen enough. The plan had been for teams that weren’t able to host one of the games in ’99 would host one in 2000, but we never got that far. 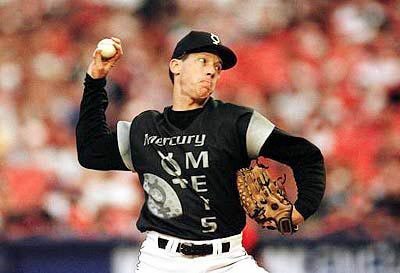 UW: The Mets really broke the mold with their Mercury Mets concept. Was that their idea? SM: It was definitely their initiative. They took it to the next level. And, frankly, they did it the way it was supposed to be done by all the teams. The problem with the uniforms most of the teams wore was that they weren’t traditional enough or futuristic enough to sell the concept. UW: Yeah, so many of them featured the same basic concept: Take the cap logo, blow it up really big, and put it slightly off-center. It was the same thing over and over again. Was that the plan all along? SM: MLB wanted to control the uniform design, control the brand, so we lost control of that. That was their decision. They didn’t want to step outside the box too much. UW: So if you’d been allowed to do it the way you wanted, the designs would have been more varied and more futuristic? SM: Oh, absolutely. The designs we had envisioned were more creative. I mean, again, you have to remember, some of this was a function of everyone involved trying to get things done on a week-to-week basis. There was not enough manpower or time to create a whole new look for each team. That’s one of the reasons we ended up with the cookie-cutter approach. Take every team’s logo, blow it up, wrap it around the side, boom. UW: Regarding these other ideas that you and your team had, did you have mock-ups or drawings or prototypes of those concepts? SM: I don’t recall that we had anything like that, aside from getting MLB’s designs and saying, “Hey, can we add this? Can we add that?” And we’d have to try to suggest things that wouldn’t provoke some level of push-back about making them too crazy. UW: So what you’re basically saying is, while the uniforms may have looked outlandish to some people, they would have been a little more out there if you’d been allowed to do it the way you wanted. SM: Yeah, they would have been more futuristic. I’m trying to remember some of the specifics of what we had in mind, but it’s hard to remember the details. UW: Some teams did have nice little touches, like the Phillies had that sleeve patch showing an American flag with more than 60 stars, and the Twins had a patch marking the anniversary the team would be celebrating in the year 2021. Did those touches come from MLB, or from the teams, or from your people? UW: You mentioned earlier that there was a lot of negative reaction to the uniforms — from fans, from players, and from the media. How did you feel about that at the time, and how do you feel about it now? UW: So it was sort of a damage control situation? SM: I wouldn’t call it that. From a local standpoint, there were teams that did it right. They got some good publicity. But at a national level, there was stuff like ESPN making fun of the uniforms, and some players having a problem with it. And that was one thing that the Mariners had done the year before, and that I wish we could have done, but there wasn’t time: They got the players involved with the uniform design. We also could have done a better job with the national media in terms of selling it to them, getting them involved. But the weak link was really the PR, getting out in front and making sure people knew why we were doing this, which was just to provide some value-added fun and entertainment for the fans. UW: Ten years later, how do you feel about it? Is this something you’re proud of? Because at the time, a lot of people were saying, “Man, whose idea was this?” And you’re basically saying, “Me. It was my idea.” Are you proud of that? SM: Sure. It was voted one of the 10 worst promotions of all time, and if I’m up there with Bill Veeck and Disco Demolition Night, that’s OK with me. UW: And hey, here we are talking about it 10 years later, so I guess that says something right there. UW: I can promise you that I’m not chomping on a cigar or eating a hot dog. SM: They’re traditionalists. And this didn’t go over too well with traditionalists. That’s baseball. UW: Are you implying that this would have gone over better with a different sport? SM: I’ve been saying for years, and I’ll keep saying it until I’m blue in the face, that if David Stern and the NBA had come up with this idea, it’d still be going on every year. It would’ve been the greatest idea ever to come across the landscape. UW: Speaking of which, you mentioned that the original plan was for MLB to repeat the promotion in 2000. Why didn’t that happen? UW: And it was MLB that made the decision not to roll it over for the next year? UW: Did that sort of catch you by surprise? Like, was this whole enterprise a bit more complex than you had anticipated? SM: Yeah. Putting the schedule together was a nightmare, and then negotiating all the components. Because every team got paid to do this. SM: Oh, sure. Well actually, I shouldn’t say that — they got paid to do it if, depending on, uh, I’m trying to remember. There was a payment to the teams, but I’m trying to remember the terms. UW: Is that standard for this type of promotion? SM: Yes, that’s how it typically worked at that time. The national sponsor had to make a commitment to doing local promotions with every team, and that included the payment. UW: Nowadays you’re a professor at UMass, right? UW: And do you use this promotion as a case study or anything like that? SM: I’ve used this one in class every once in a while, yeah.